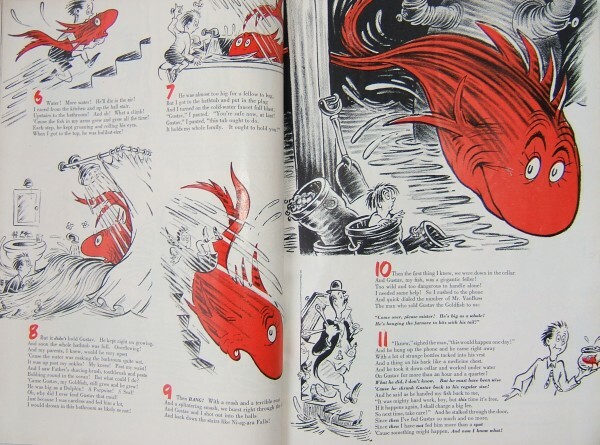 Gustav The Goldfish; written & illustrated by Theodor Seuss Giesel, Redbook Magazine; June 1950. A Fish Out Of Water, written by Helen Palmer, illustrated by P.D. Eastman; Beginner Books, 1961 (Childrens Picturebook Price Guide: $240 VG+). As a child, I loved the story A Fish Out Of Water. It was, and remains, one of my favorite Beginner Books. Written by Helen Palmer, the wife of Theodor Seuss Geisel, aka Dr. Seuss, A Fish Out Of Water has a ‘preposterous-ness’ one associates with a Dr. Seuss story. 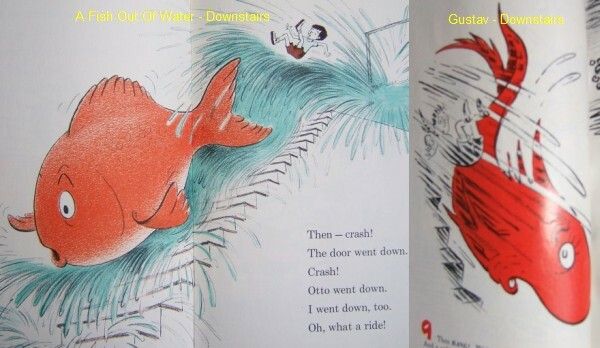 Then it’s not surprising to discover the story is virtually identical to Seuss’s Gustav The Goldfish, which was published a decade earlier in the June 1950 Redbook Magazine! 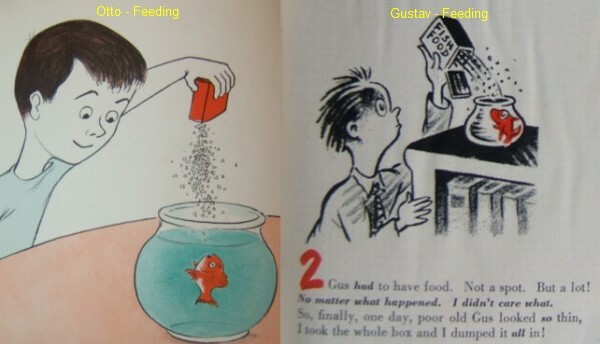 For fifty-seven years, Gustav The Goldfish, written and illustrated Dr. Seuss, has not seen the light of day . The story lines are identical. Both books start with a boy buying a fish, with the seller providing a curious warning not to over feed the fish. never feed him a lot. So much and no more! Gus had to have food. Not a spot. But a lot! No matter what happened. I didn’t care what. In A Fish Out Of Water, the boy also dumped the entire box of fish food into the tank. My little Otto began to grow. I saw him grow and grow. That fish food, I guess, must be terribly strong. The second Gus ate it, he grew twice as long! He grew twice as thick, and he grew twice as wide! Too big for his fishbowl!! His tail was outside! 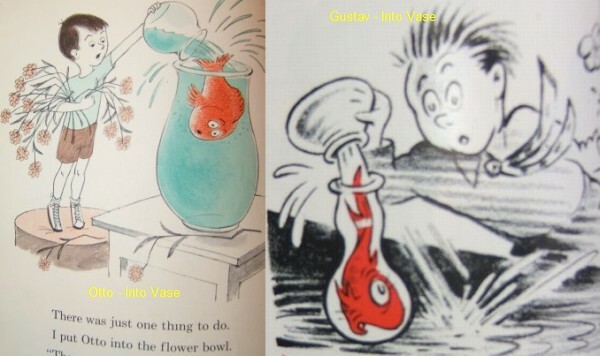 Next, in both stories, Gus and Otto were put into a larger container, a flower bowl, and proceeded to out grow the bowl. Next, in both stories, Gus and Otto were brought into the kitchen and moved from pot to pot to bigger pot. Next, in both stories. Gus and Otto were taken upstairs to the bathtub. Next, In both stories, the tub overflows, as Gus and Otto continue to grow, and the fish ends up in the flooded cellar of the house. Next, at last, we have some divergence. In A Fish Out Of Water, the boy calls a policeman, then firemen to help move Otto out of the cellar and into a community swimming pool. Next, in both stories, the boy telephones the seller of the fish, and asks for his assistance. “So you fed him too much! but you boys always do. Next, in both stories, the original seller of the fish arrives, fiddles with some items, then goes underwater for some amount of time. Then up jumped Mr. Carp. In his hand was a little fish bowl. In the bowl was my Otto! Mr. Carp had made him little again. On Gustav for more than an hour and a quarter! ‘Cause he shrank Gustav back to his regular size! Presented to you with a technique that’s new. Like all BEGINNER BOOKS, this one will prove helpful in developing reading skill. It is written with ONLY 175 DIFFERENT WORDS – the majority of which a child learns in first grade. The theme is skillfully evolved to ensure the word repetition necessary in building a “sight” vocabulary. Yet these word repetitions never become drills – they are basic to the plot so that a child will feel he is reading only for fun. There is little question that Helen Palmer wrote A Fish Out Of Water. In 1950, it is very likely she helped Geisel with the story and composition of Gustav The Goldfish, just as she helped him with many of his stories. Which is not to say they collaborated on Gustav, or any of the Dr. Seuss poems, since Geisel’s method was to painstakingly scrutinize every word, every line, every verse. Palmer was more an advisor, reviewer, or contributor than a collaborator. Still, Helen Palmer never received official credit, in the form of copyright rights, for any of Dr. Seuss’s books. So, quid pro quo, the sole copyright holder for A Fish Out Of Water is one Helen Palmer. “Helen Palmer, graduate of Wellesley College and Oxford University, was a teacher of English before she became involved in the creation of books for children. She has since edited literally dozens of successful juveniles and written an even dozen of her own. The “eccentric writer” LeSeig, Geisel spelled backwards, of course is Dr. Seuss. A bit odd, this concerted effort to distance Palmer’s connection to the leading best selling author/illustrator of children’s books (and, at that time, President of Beginner Books—the Geisel’s sold Beginner Books to Random House in 1960, however retained Geisel as President). The result, for some forty years, is the public’s perception that A Fish Out Of Water was an original story authored solely by Helen Palmer. The cleverness of the story, the ‘preposterous-ness’, obviously, is due to Dr. Seuss. And now, after fifty-seven years, Gustav The Goldfish, written and illustrated Dr. Seuss, has surfaced anew. Initially published in the July 1950 Redbook, If I Ran The Zoo was later made into a book (after some modification by Seuss), won a 1951 Caldecott Honor award. 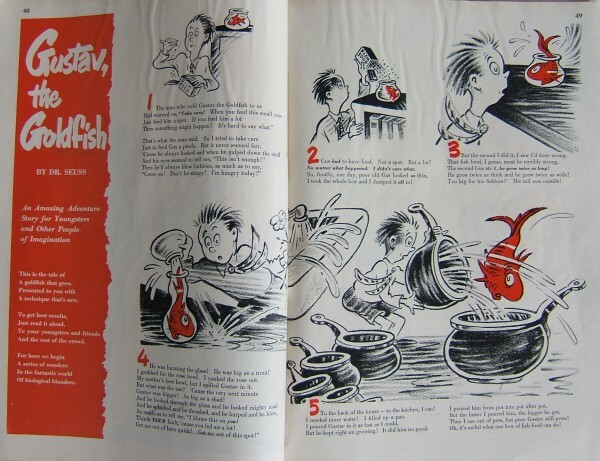 Five of the other Seuss Redbook stories were collected and published in books. In 1958, three stories were compiled to become Yertle The Turtle and Other Stories. In 1961, two of the Redbook stories went into The Sneetches and Other Stories. In most cases, Seuss expanded upon the Redbook original stories before publication into a book. Thirteen of the Redbook stories have never been reprinted, or published into book form, tallying nearly twenty pages of original Dr. Seuss material. 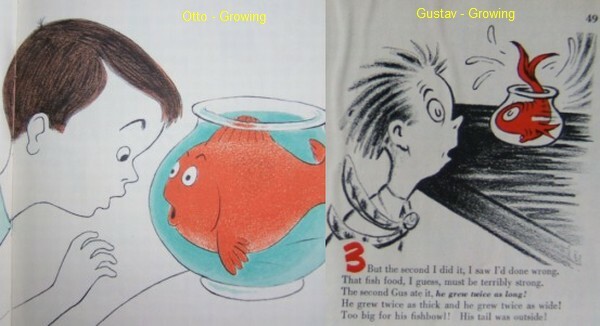 Gustav The Goldfish was the first of the twenty-two Seuss poems published in Redbook Magazine. And finally, after a fifty-seven year wait, has surfaced, deservedly anew. Morgan, Judith & Neil ; “Dr. Seuss & Mr. Geisel”, pg. 168; Random House, 1995. 3) Our June 2006 blog article referencing the Redbook Magazine containing the Gustav story (http://1stedition.net/blog/2006/06/dr_seuss_redbook_magazine_orig.html).